As promised, it is time to finish up that layer cake. 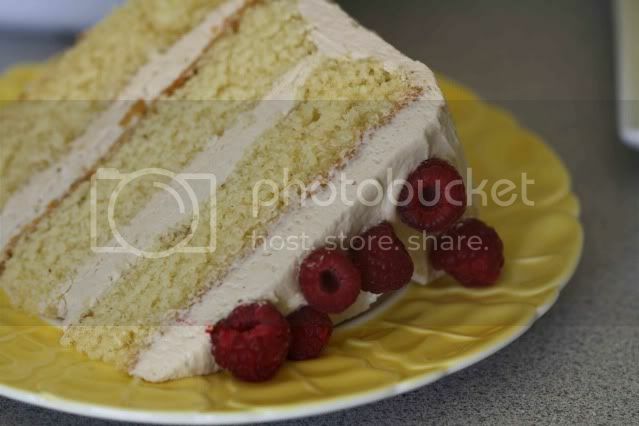 The last post on layer cake brought us through baking and freezing the cake. Today is frosting day. The first step is to pick your frosting. I wanted to match, not contrast, the rich, nutty flavor of my brown butter cake. Martha Stewart’s brown sugar buttercream seemed like it would provide a great flavor that would go well with the cake. Plus, I happen to like the sound of brown butter cake with brown sugar buttercream. Follow the recipe below or choose any frosting you like to complement your cake. Once the frosting is made, take your cake layers out of the freezer and let them thaw slightly before trying to frost them. They do not need to thaw all the way, in fact a cool and slightly hard cake is a little easier to frost, but I found that my layers had warped ever so slightly in the freezer. 20 minutes on the counter was all they needed to return to their frostable (yes, I made up a word), level shape. While researching layer cakes I discovered what it seems most of you already knew – if you want a smooth final product, you need to start with a crumb coat. It is unfortunate that I am just learning this now because it’s a genius step that results in a professional looking product. If you, like me, are new to the crumb coat, here are the basics. After stacking your layers with whatever filling you are using (in my case, more frosting) slap a very light coat of frosting over the entire cake. It doesn’t need to completely cover the cake and it doesn’t need to be smooth. I like to think of it as frosting spackle. It fills in the nooks and crannies so after a bit of chill time in the fridge, it is 10 times easier to get the final layer of frosting looking fabulous. Once your crumb coat is on, let your cake hang out in the fridge for at least an hour. 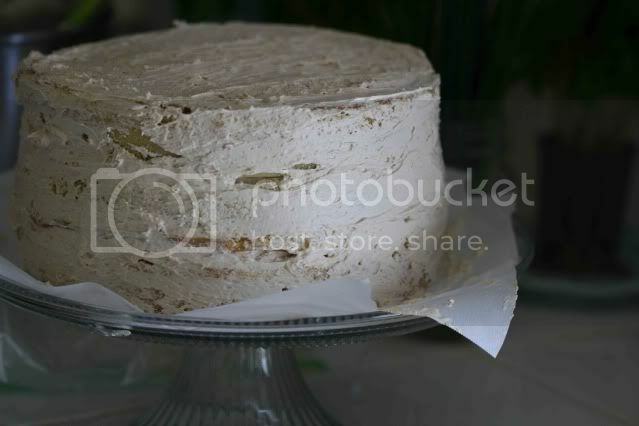 The frosting will firm up and hold onto the cake as you apply the final layer. If you have time, chill the cake one more time after the final layer of frosting is on before adding any decorations. I was ready to be finished with my cake so my decoration consisted of a pint of raspberries scattered over the top of the cake. 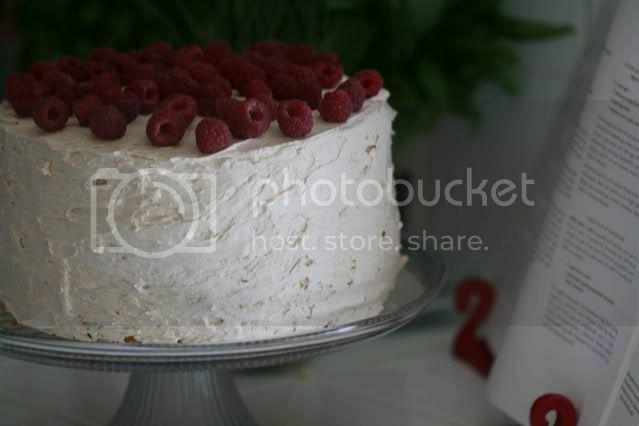 A move more lazy than calculated, it paid off as the fresh raspberries were a welcome break from the sugary frosting. Serve your cake at room temperature and enjoy the end result of all your hard work! Place the egg whites and sugar in the heatproof bowl of a stand mixer and set over a pot of simmering water in a double boiler set up. Whisk the egg whites and sugar together until the mixture reaches 160* (a candy thermometer comes in handy here). Place the bowl on a stand mixer fitted with the whisk attachment and whisk until the egg white and sugar mixture holds stiff peaks, then continue whisking for six more minutes until the mixture is cooled. Switch to the paddle attachment and beat on medium-high while you add the butter, a few tablespoons at a time. Once all the butter is incorporated, stir with a spatula until smooth. That cake is just gorgeous! And I have never heard of this crumb coat business, but it sounds like a clever trick. Of course, a crumb coat. So obvious, yet I've never coated my crumbs. Perhaps I need to make more cakes. So pretty! I made a layer cake yesterday. I already ate half of it!! Seriously, my mouth is watering. Brown butter cake and brown sugar buttercream is right up my alley. That cake is stunning and I appreciate the tips. I would like to know how you manage to get the frosting on without it being smeared all over the plate. I have given up and just frost the top of cakes now, as It always looks messy. Beautiful! Thanks for the tip! So elegant and understated - I love it. It's as good as I thought it would be. Mmmmm. Not only do these look delicious, but they're so pretty too!